New Orleans The march in New York demanding action on climate change was hard to get a handle on from a distance. The Associated Press called the number 100,000. The New York Times studiously avoided ever giving a number in the aftermath of the march, simply saying there were tens of thousands. Finally, a week later the Times’ editorial page tagged the number at 300,000. Between police, press, promoters, and regular people, it’s very difficult to get a handle on facts when it comes to organizing, and when we are looking for the heartbeat of a movement, it’s actually not just a question of engineering, but a way to measure passion, so it is actually very important. So many mainstream institutions and media are so punctilious about not seeming to support protest that it is virtually impossible to benchmark the truth as opposed to the promotion. Talking to Dean Hubbard, national director of the Labor Project for the Sierra Club, on Wade’s World on KABF recently, opened up a different perspective. Dean said they were astounded by the numbers. They had expected 100,000 in New York City, but instead they thought the numbers had topped 400,000. We’ll never know. 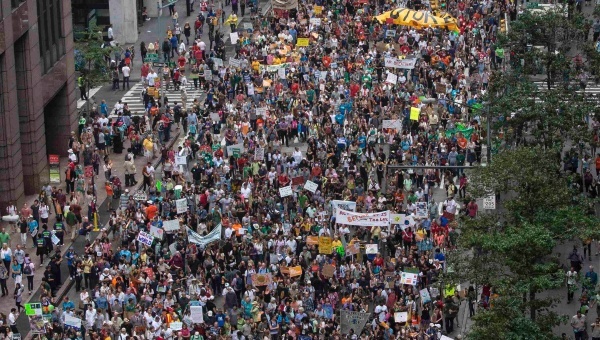 He argued, perhaps more interestingly, that the wider footprint of the march could be found in the hundreds of cities throughout the USA that did something on that date and the thousands of cities, large and small, that stepped up to the mark globally. President Obama seemed to have used some of this energy to argue more aggressively for action, not only in the USA, which as the worst of the worst, has to be a leader here, but also to challenge China to join the fight as the largest bulk polluter even though we are the greatest per capita polluter. India, the next in line, seems still unwilling to join the fray. It’s Dean’s job to argue that the fight between jobs and the environment is finally reaching détente, and he made the case as best he could, and there’s merit to his argument. His weakest point might have been the fact that there were 10,000 marchers under union banners in New York City, led by some predictable unions like the Service Employees, but also importantly the giant Local 3 of the International Brotherhood of Electricians, a critical chink in the armor of the construction trades which have been stubbornly resistant to many environmental arguments with a “jobs are everything” and the devil take the hindmost attitude. Mayor Bill de Blasio’s announcement that he supported retrofitting all of the buildings in New York City before he personally joined the march, was a key piece of leadership moving the NYC trades. Where Dean and the Sierra Club’s case improved was as he recited the increasing amount of alternative energy development that is replacing standard generation methods, and the number of jobs that are, and will be, produced by such construction, energy creation, and distribution. It seems impossible to argue whether on the threat of climate change or the ticking time bomb of contemporary resource depletion that no matter the math now or the facts on the ground, that the tide of history is now flowing in the direction of Dean’s argument with the opponents cries simply being the gurgles of dinosaurs on their way to extinction, hopefully not bringing the rest of us with them. This entry was posted in Labor Organizing, Organizing and tagged Climate Change, environmental issues, Howard Dean, jobs, labor, Sierra Club, unions by Wade. Bookmark the permalink.